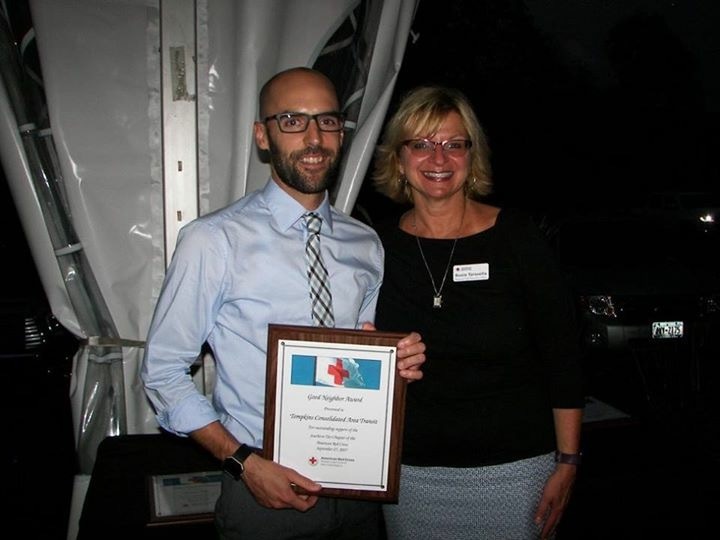 TCAT was honored by the American Red Cross Southern Tier Chapter at its annual Volunteer Recognition Dinner in Apalachin, NY, on Wed., Sept., 27, with a Good Neighbors Award for helping evacuate tenants at an apartment building fire in Slaterville Springs last winter. It all stemmed from a freezing cold night on Fri., Dec, 30, when TCAT Transit Supervisor Mike Smith sprang into action to drive a bus to provide shelter and transport to tenants displaced by the blaze at Fountain Manor Apartments. That night, Smith had just arrived home around 10 p.m. after a long day at work. Normally, he would still be on duty until the wee hours of the next morning, but TCAT was on holiday schedule with service ending earlier. He had a rare chance to work an earlier shift and leave early. But, just after walking in his door at home, Smith’s phone rang. It was from a Tompkins County Department of Emergency Response official who told him about the fire and asked for assistance. Smith drove back to the garage and drove a bus 10 miles to the apartment building. Over a more than four-hour period, Smith waited in the bus with the tenants while firefighters and apartment complex employees checked on pets and retrieved necessities for the residents from their apartments to include medicine, shoes and clothing. Smith helped the tenants, whom he said were “very calm and understanding given the circumstances,” get comfortable on the bus and to stow their belongings. They were taken to the neighboring Caroline Town Hall for immediate shelter where some residents contacted family and friends who later picked them up to lodge in their own homes. Meantime, the Red Cross made arrangements to provide a roof over the heads of the other remaining dozen displaced tenants at the Best Western/University Inn at East Hill Plaza. Finally, around 2:15 a.m., when everyone finished their interviews with the Red Cross, had what they needed from their apartments, and after friends and family arrived to take some of the residents to their homes, Smith drove the remainder of the tenants to rest their weary heads at the hotel. “Mike was just super, super…” said Harrington, who is well known in Tompkins County as a force of nature when it comes to coordinating resources and helping people in need and during emergency situations. On Wed., Jan. 11, TCAT Dispatcher Ray Davis assisted those residents when they were given permission to return to the apartment complex after what ended up as an almost two-week stay at Best Western. Davis drove a bus to pick them up and deliver them to their ventilated and newly cleaned apartments. Davis assisted tenants with their belongings and helped them get comfortably situated on the bus. Upon arrival, he also helped them back into their apartments. Harrington, whose husband Slaterville Volunteer Firefighter Greg Harrington was at the apartment complex when the tenants returned, also thanked TCAT staff for their help. “He was very impressed with your kindness and help with the Fountain Manor residents, including carrying their belongings to their apartments,” she said.